On a nice summer evening having a nice barbecue, just relax with a book in the garden or organize a cozy garden party; with a cast-iron terrace fireplace you extend your summer evenings and enjoy a pleasant warmth and a cozy atmosphere. Patio fireplaces are available in different designs, price ranges and materials. If you like a nostalgic and authentic atmosphere, a cast-iron fireplace is an excellent option. The round shapes and the raw material give your garden character and a warm atmosphere. Cast-iron is a steel alloy of iron, carbon, manganese and silicon, which forms a solid and good insulating material. An advantage of cast-iron is that the material holds the heat well. This allows you to enjoy the heat for a long time, even when the fire is almost out. In addition, you probably use less wood than fireplaces of other materials that hold less heat. The material is sturdier and heavier than, for example, stainless steel, which keeps the fireplace clean and resistant to pressure. A number of cast-iron outer hinges are provided with a door with spark shield that prevents sparks from sprinkling. This will protect your patio and your clothes from small fireplaces. Because a cast-iron fireplace is a bit heavier, the displacement of the fireplace is less easy than with lighter materials, such as a stainless steel fireplace or a corten steel patio firreplace. A cast-iron terrace fireplace requires little maintenance. The material is strong and pressure resistant and lasts for years. However, there are some things you can do to extend the life of your fireplace. First of all, it is important to always place the fireplace on a flat surface. If the fireplace is not solidly placed, it may fall over and this can damage the fireplace and the garden. The material is strong, but at the same time also quite vulnerable. In case of falling over, cracks may occur in the material. Cast-iron is not stainless material, so in rain it is advised to cover the fireplace with a protective cover. Most cast-iron fires are supplied with a lid that prevents rainwater from entering the fireplace. In addition, you can also provide the fireplace once a year with a special coating to prevent corrosion. 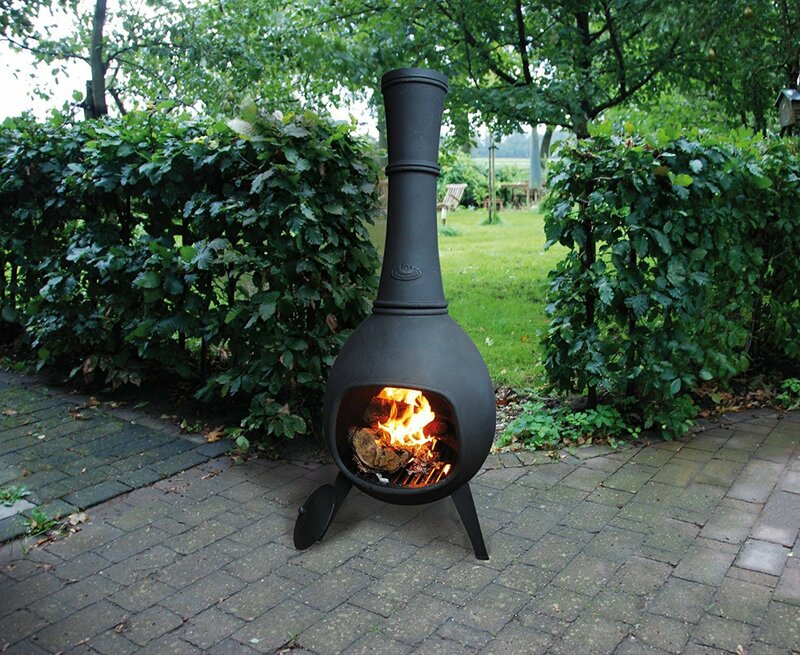 This way the fireplace stays beautifully black and you can enjoy the warmth and cosiness of your garden for years. Firepit-online.com has a number of beautiful cast-iron fireplaces in the assortment. There is a suitable model and size for each garden. Almost all the articles, including the cast-iron outdoor fireplaces, are in stock. If you order before 17:00, your order will be shipped still the same day for a quick delivery at your place; you can immediately enjoy the warmth and atmosphere on your terrace.